Red-lined and sprinkled with symbols locating items and places of interest (intended to guide return visits), my county maps tell the plenitudinous story of roads traveled over the years and discoveries made along the way. A wealth of precious chance encounters. A small waterfall here, and old farm house over there. Instead of the sweet renewal of an old acquaintance, however, return visits can often be a source of dismay and downright consternation. Natural roadsides once rich with wildflowers are widened, straightened, cutback and bare. Old churches once emblems of community heritage are either replaced or strangled by multiple mismatched additions framed with edge to edge blacktop. Country stores unable to compete with full service convenience plazas are boarded up and overgrown. 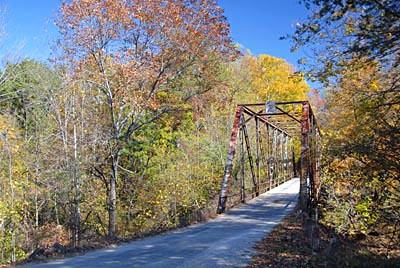 Early yesterday morning, with trepidation I turned southwest on Johnson Mountain Road and headed toward a map symbol labeled 'old plank bridge'. Cautiously ready for a taste of bitter tea. Instead, that chilly morn the tea was mellow and sweet. A blessed reprieve, still standing, still spanning. Goose bumps rippled like the shallow waters of Salacoa Creek, and all was right with the world. 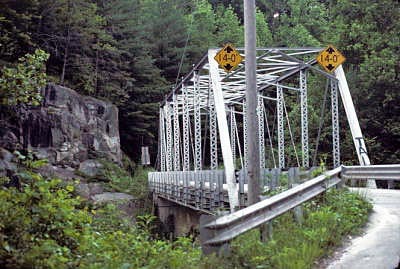 A beautiful old truss bridge. Hard working, dependable, honest and loyal, dedicated to community service, cute as a speckled pup. And, fast disappearing. 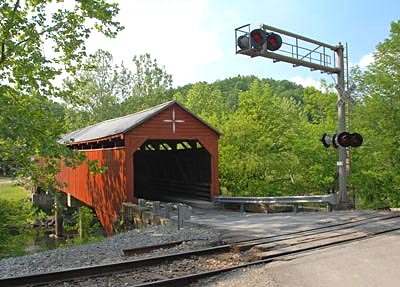 It took us many decades to appreciate old 'covered' bridges; now, only a few remain mostly as registered historic structures, maintained and protected somewhat from fire bugs and vandals. I hope we don't follow the same path with these precious relics before they too are gone forever. Love 'em, while they last. Mile 50.9, 1:40 pm. "Arrive Cr 1328 near Adako. 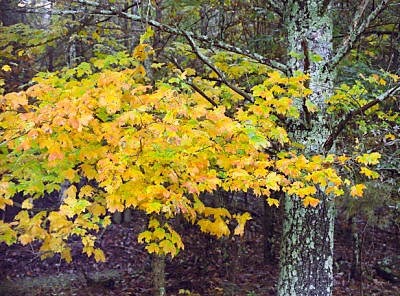 There's a sign - USFS Pisgah, Mortimer Campground, 8.5 miles. Turn right on Cr 1328, head north to Mortimer. Recent storm. Many trees blown down. Hope roads are clear. There's a skunk." Mile 53.6, 1:50 pm. "Cr 1328 skirts beside a great gorge. 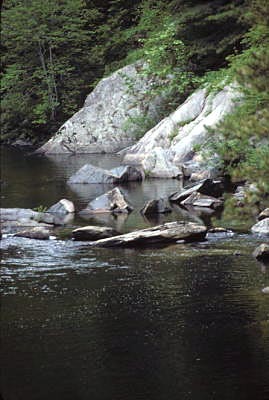 The gorge carries Wilson Creek for a tremendous run over and around beautiful rock formations. Recreation abounds. Even on Wednesday. Cars, swimmers, bathers, yuppies cruisin', kayakers." Mile 55.6, 2:00 pm. 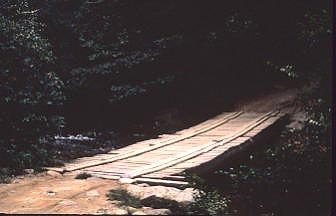 "Arrive Wilson Creek Bridge." 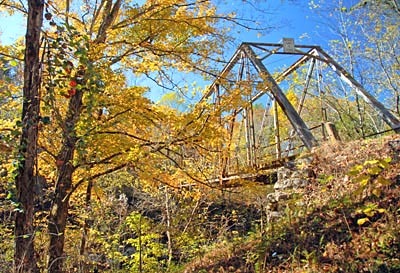 The ancient bridge sits alone long removed from public service. How many times did the doctor ride his horse across to help deliver a new baby, or the mailman to spread the daily news. How many times did the kids walk across on their way to school, most barefoot by early Spring. 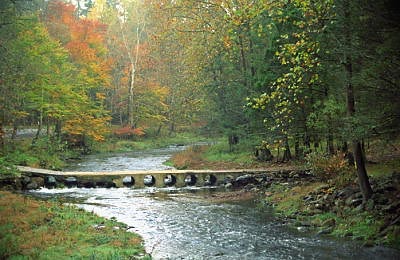 How many sturdy wagons creaking with logs crossed to the sawmill, or family carriages to market heaped with corn, beans, and potatoes. When did the first Model T break the quiet and sentence this crossing to isolation and ultimate decay. "Why," a sentimental old fool might wonder out loud. Unable to hold it inside. 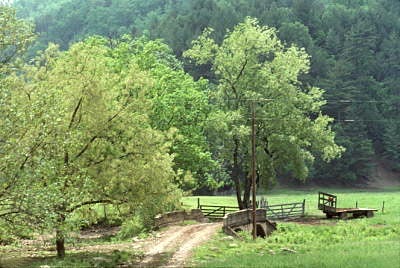 Near Carrollton, West Virginia, a splendid barn-red covered bridge spans the Buckhannon River flowing to the right to confluence with the Tygart Valley River about a mile downstream, thence due north to the Cheat, to the Monongahela, to the Ohio and beyond. That lofty horizon, however, does not lessen the resolve needed here to simply reach the other side. It deserves post card status. 4:10 pm. Easing cautiously south on McDonald Road a little east of Newton Factory Shoals, my gut's knotted with dread. I'm chasing a hot assignment: Find a Red Clay Democrat! The Rolling Stones blast from the Beagle's overdriven speakers, baiting my hook like a dough ball dangling in front of a hungry channel cat. Down the road, down the road, down the road apiece." 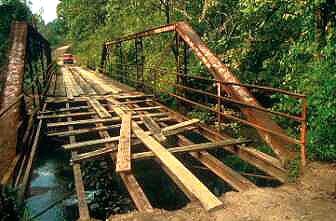 We boogie mindlessly around a blind curve and happen upon an olden steel truss unattended, abandoned, and disrespected. Its planks commandeered by brigands for duty elsewhere. And, in spite of everything, determined to shake off decades of sticky gooey red clay. The backroads score again. Always delirious; and chock full of chestnuts, parables, precious old expressions, homonyms, antonyms, synonyms, and even a few m-and-m's. Like, I wish I could have seen this truss when it was new…. Or, the end of the road is not end of the world. All roads lead to uncertain outcomes, and opportunities foregone. Once a path is chosen it cannot be undone. Because it was grassy and wanted wear." Note: Log your most revealing metaphors about this photo in the "Comments" section. Each will be awarded a copy of my next book, and will become sole property of Doctor Flowers Enterprises, Inc.